Microsoft rolled out its Internet Explorer 9 Platform Preview 3 today, and, yes, it does include the HTML5 canvas element, and yes, that element is hardware accelerated, and yes, Redmond is still saying that performance and compatibility share "job one" status. Platform Preview 3 obsoletes the earlier versions, the first debuting at the Mix conference this March and the second released just last month. 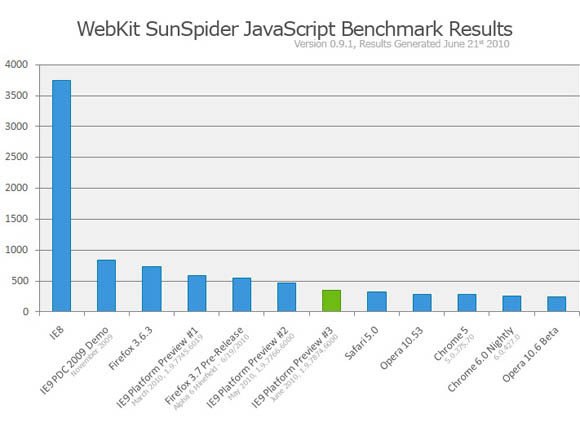 Opera 10.6 Beta currently holds SunSpider bragging rights — but, really, what's 50 milliseconds among friends. "It's about the time it takes to blink your eye," said Ryan Gavin, IE's senior director, who must have especially agile eyelids. As recently as last month, Microsoft wouldn't officially say whether support for HTML's canvas element would be rolled into IE9. At the Web 2.0 Expo in San Francisco, Microsoft IE evangelist Giorgio Sardo told The Reg that Microsoft had not committed one way or another on canvas. Today it did. That 2D graphics scheme is now officially part of the IE9 party. And, like essentially all of IE9's GPU-enabled graphics support — even text rendering — it's hardware accelerated, presumably using XNA, though no mention of that game-centric graphics technology was made at Wednesday's event. Although IE9 will be enlisting GPU power for graphics, video, and — in some cases — audio, what it won't be using it for will be GPGPU technologies such as OpenCL — which stands to reason, seeing as how Microsoft hasn't embraced that standard. And speaking of standards, director of IE product management Roger Capriotti told The Reg that although patent-backed H.264 is Microsoft's video codec of choice for IE9, it will also support Google's recent open source gift to the world, WebM/V8, if a user has that codec on their machine. However, Redmond has yet to make a decision, Capriotti said, about how to handle the open source Ogg Theora codec. Capriotti also ridiculed the charges made by some observers that Microsoft is promoting H.264 to make a few bucks off of it in licensing fees, telling The Reg that the amount Microsoft earns from H.264 is small enough to make such charges risible. He also pointed to a blog post by IE general manager Dean Hachamovitch which cites "hardware support, customer and partner readiness, and intellectual property rights as key factors" in Redmond's choice of H.264. After touting the performance and compatibility of IE9 at the Wednesday event, Ryan and Manceri showed a raft of demos of Platform Preview 3 soundly and repeatedly thrashing both Firefox and Google Chrome in a series of graphics and video demonstrations. While IE9's victory was to be expected — it was, after all, a Microsoft event — you can run your own comparative tests: load up Redmond's Test Drive site on any and all browsers that you want and try the demos yourself — provided, of course, you're running Vista or Windows 7, since IE9 won't run on Windows XP. One Microsoft exec, by the way, assured The Reg that the demos will run on any broswer, unlike Apple's since-debunked "Safari only" HTML5 Showcase. Speaking of Apple, The Reg asked Microsoft engineer Jason Weber, IE9's performance lead, whether Microsoft's new browser technologies would give a performance boost to Adobe's much-maligned web graphics and video technology, Flash. "We're not hardware-accelerating them," he said. "They're going to have to hardware-accelerate themselves. We would love Flash and other technologies to follow our lead and hardware-accelerate themselves. And some of those technologies have — Silverlight's hardware-accelerated." Essentially, he said, when you browse to a page in IE9, "The page itself will be hardware accelerated." He then crossed his fingers and thumbs into a small square: "But that little region itself won't be hardware accelerated."